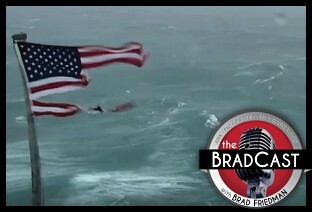 " 'Disaster's at the Doorstep': 'BradCast' 9/13/2018	"
It was the final primary election day of the year today, before the crucial November midterms, and we've got coverage of results out of Rhode Island, which voted on Wednesday, and problem reports out of New York, which voted on Thursday. But first, the latest on Hurricane Florence as she begins to make landfall on the U.S. southeastern seaboard and, while downgraded to a Category 2 as of air time, still poses an extraordinary and potentially catastrophic threat to millions of Americans from not just winds, but massive storm surge and rainfall (and a host of toxic threats to go with it.) That's the first, but hardly the only disaster covered on today's program. Then, reported primary results from the final federal primary election of the year in Rhode Island on Wednesday, where a "computer glitch" via a third-party vendor who runs the state's DVM website imperiled thousands of voter registrations this week. Thankfully, in what may be one of the only disasters averted, as covered today, the problem was discovered in time for those voters to be properly added to the rolls before polls opened for Wednesday's elections. The largely "blue" state saw victories for both centrist and progressive Democrats alike. We report on a number of the noteworthy results. The news may be less good for voters in New York, which is holding the final primary contests of the year for state and local offices --- their federal primaries were held in June. Problems are being reported today by voters in New York City who said they did not appear on the rolls at precincts today as expected or whose party registrations were inaccurate. Several closely watched contests by progressives are on the ballot, including actress Cynthia Nixon's Democratic primary challenge to Gov. Andrew Cuomo and progressive activist Zephyr Teachout attempt to win the Dem nod for state Attorney General. We discuss what we know (and don't yet) about those widespread voter registration problems being reported today, which echo massive disenfranchisement problems during the 2016 Presidential primary between Hillary Clinton and Bernie Sanders in the Big Apple. That 2016 disaster was due to an unlawful purge of more than 100,000 voters by the NYC Board of Elections. However, despite persistent claims by many Sanders supporters to this day, no evidence exists to tie the illegal purge to either Clinton or the Democratic Party itself. The cause for what may --- or may not --- have happened today, remained even murkier as of airtime. Next --- after disturbing breaking news out of Massachusetts where fires have exploded in at least 60 homes in three communities north of Boston, for still-unknown reasons, and out of Hawaii, where Tropical Storm Olivia has nearly topped an earthen reservoir, threatening thousands who live below its dam --- a brief, if angry rebuttal to Donald Trump's twisted and wholly fabricated claim today that some 3,000 Puerto Ricans did not die due to last year's Hurricane Maria in Puerto Rico. Yes, the President of the United States is now a Maria Denier, claiming that Democrats are somehow behind the officially confirmed numbers --- which are higher than 2005's Hurricane Katrina or the 9/11 attacks --- and simply made them up to "make [him] look as bad as possible". We share the actual facts behind the (conservatively low!) numbers and some of the broad condemnation in response to his false claim from both Democrats and Republicans alike today. « PREVIOUS STORY "'Green News Report' - September 13, 2018"
"'Disaster's at the Doorstep': 'BradCast' 9/13/2018"
Did either of you get a chance to watch/listen to Chris Hayes program on Wednesday with Michael Moore and people from (Flint) Michigan. In it some of the people of Flint explain why they voted in all areas of the ballot except for president in 2016. It was the best explanation of the politically disillusioned I have yet heard. They were appalled by Trump but the Democrats (including the Candidate's husband) have done little to nothing for them for the last 40 years, so they did not feel either deserved their vote. Unfortunately they used the term "inspired" to describe a candidate they wished they could vote for (possibly Sanders). Regardless of that poor choice of words. It shows that nationally the Dems have a lot of work and fence mending with a vast liberal leaning electorate that feels no one represents them ahead, if they want people to vote for them and not just against the Republicans. There are lots of people who voted for no one (Brewster's Millions "None of the Above"), or third party candidates because our two party system is broken and needs an overhaul. Not sure if you could get Michael Moore on your show (maybe one of his writer/producers), but there are many issues he supposedly covers in his recent documentary that are right in the Bradcast wheel house. Always look forward to the next show, whether I get a chance to hear it or not. Keep up the good work. WTP knew Trump was a player, but he wasn't a player in the whitehouse under the Oval office desk. Who cares, we have much bigger problems, and since DEMS allowed 20 years of Clintons, & even wanted Bill back in the oval office with Hillary its extremely ironic any time is spent talking about Trump! Can't tell if U R a trump basher, but came on site for voter machine data. If its a trump bashing site, that is too bad, because U seem to have good data on voter fraud.